VISHAY Intertechnology, represented by Braemac , has released the first device in a new series of miniaturised infrared receiver modules featuring 3V operation and high immunity to ambient light disturbances. 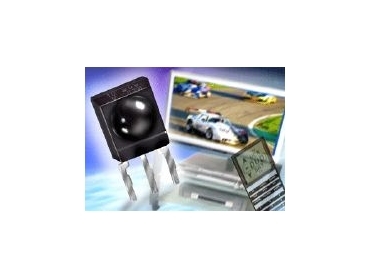 Capable of operating on supply voltages as low as 2.4V at a distance of 35m, the new TSOP34838SS1A is intendedfor infrared remote control systems in end products including toys, televisions, DVD players, VCRs, and set-top boxes. With a photo detector and preamplifier combined in a single, compact package measuring just 6.95mm by 6mm with a height profile of 5.6mm, the new receiver module from Vishay Semiconductors allows designers to develop highly integrated, space-saving, battery-powered remote control systems. Integrated automatic gain control (AGC) suppresses all kinds of light-source disturbances, while internal shielding offers protection against electrical field disturbances. The module's epoxy package doubles as an IR filter. An internal band filter allows PCM frequency operation. The TSOP34838SS1A can operate with all common data formats, featuring a maximum data rate of 1000 bit/s with a suitable burst length of ©¯10 cycles per burst. A demodulated output signal that can be directly decoded by a microprocessor facilitates use of the module in multimedia applications. The new receiver module is specified for supply voltages ranging from 2.4V to 3.6V and is TTL and CMOS compatible.